ALPHARETTA, Ga., September 18, 2012 – Nexxt Spine LLC, a Fishers, Ind.-based manufacturer of spinal implants and instrumentation, has received 510(k) clearance from the U.S. Food & Drug Administration (FDA) for its new Honour™ cervical spacer and lumbar spacer implants made of Zeniva® polyetheretherketone (PEEK) rods from Solvay Specialty Polymers USA, LLC. Zeniva® PEEK – part of Solvay’s line of Solviva® Biomaterials – has a modulus very close to that of bone plus excellent toughness and fatigue resistance. The FDA clearance was based in part on Solvay’s well-developed master access file for Zeniva® PEEK. Nexxt Spine’s new Honour™ Spacer System consists of three unique implants which are offered in various footprints, with indications ranging from the cervical to the lumbar spine. The system is versatile enough to accommodate unilateral (TLIF and oblique) and bilateral (PLIF) approaches in the lumbar spine with the option to insert directly or initially on its side to prevent over-distraction of the ligamentous and nerve structure, according to the company. The spacer systems, made from various sizes of Zeniva® PEEK rods, are hollow so that bone can grow through the device, fusing the adjacent bony surfaces of the vertebrae. 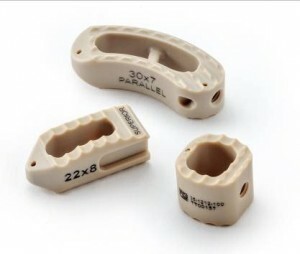 “We chose Zeniva® PEEK for its similarity to the modulus of elasticity of bone, radiographic properties, and the widespread commercial and regulatory acceptance of the material,” said Eric Lintula, Director of Engineering for Nexxt Spine. Lintula added that the use of Zeniva® PEEK in the structural portion of the spacer resulted in extraordinary repeatability. “Since the core function of the spacer is to restore the original disc height and maintain this height under physiological loads until arthrodesis occurs, having repeatable compressive strength gives our surgeons confidence they will have consistent clinical results,” explained Lintula. Zeniva® PEEK offers numerous advantages over metals such as titanium for these intervertebral implantable devices. The material offers many important benefits including biocompatibility, chemical inertness, and a modulus of elasticity that is close to that of bone. Based on biocompatibility testing, Zeniva® PEEK demonstrates no evidence of cytotoxicity, sensitization, irritation, or acute systemic toxicity. It also boasts high strength and stiffness and has radiolucent properties which permit x-ray procedures. Nexxt Spine buys Zeniva® PEEK rod stock directly from Solvay Specialty Polymers and machines and designs a full range of spacer sizes and configurations. “We’re excited about the commercial success of Zeniva® PEEK in the spinal fusion market,” said Shawn Shorrock, global healthcare market manager for Solvay Specialty Polymers. “The ongoing acceptance of Zeniva® PEEK has validated our approach to the spinal market and we’re encouraged by the momentum we’ve generated.” Nexxt Spine plans to use Zeniva® PEEK in the expansion of its Honour™ Spacer System product line. Zeniva® PEEK and the entire line of thermoplastic Solviva® Biomaterials are manufactured in compliance with the relevant aspects of ISO 13485 and under the relevant aspects of current Good Manufacturing Practices. Solvay’s biomaterial manufacturing processes are carefully validated and enhanced controls provide product traceability. In addition, all materials are tested in an accredited lab that is ISO 17025 compliant. Solvay is currently in active product trials with several major medical device manufacturers using Zeniva® PEEK and other Solviva® Biomaterials. In addition to Zeniva® PEEK, Solvay’s Solviva® Biomaterials line includes Proniva® self-reinforced polyphenylene (SRP), one of the world’s stiffest and strongest unreinforced thermoplastics, which offers exceptional hardness and biocompatibility; Veriva® polyphenylsulfone (PPSU), which provides unsurpassed toughness combined with transparency and excellent biocompatibility; and Eviva® polysulfone (PSU), which offers practical toughness in a strong, transparent polymer. These sterilizable products are available in injection molding and extrusion grades as well as rods and plates for machined components.